In cooperation with GIZ, CEVES is conducting a preparatory project for establishment of SME Observatory – that would focus on more in-depth analysis of SME business climate and market intelligence. The quality of the SME sector’s business decision-making. Build connections and trust among SMEs, ultimately promoting much needed economic integration. Serbia, as a slowly recovery economy, has lot to gain from fostering linkages, information sharing and collaboration between firms, than usually expected. In Serbia, SMEs are of great importance, because in many ways they serve to preserve and develop islands of productive capacity that are not accessible to large and foreign investors and would otherwise be simply disappearing. However, characteristic to the recovery is that firms often tend to develop in isolation from one another. We observe almost no territorial clustering and limited integration/collaboration among firms. Therefore, the goal of SME Observatory is to enhance Serbia’s potential for sustainable economic growth of SME business sector by producing knowledge, making connections and providing regular public information. Serbia’s Sustainable Development: How are we doing? The brochure “Serbia’s Sustainable Development: How are we doing?” is prepared within the project “Preparatory Project for a Society-wide Dialogue Platform on SDGs for Serbia” supported by the Swiss Government . Brochure represents a useful guide through Serbia’s most important sustainable development challenges and the strengths it should build on to accelerate its development and put it on a sustainable path. The overall goal of the proposed project is to contribute to Serbia’s development efforts by providing analytical information on economic structures, stakeholders and institutional players as well as to suggest some immediate measures that could be taken to accelerate growth, and ensure that it is more inclusive and regionally equitable. The beneficiaries of this would be Serbia’s citizens, particularly those living in territories that are lagging behind in terms of employment and overall levels of development. More specifically, we aim to produce two kinds of practical knowledge that ultimately aim to provide suggestions for specific intervention measures that can be undertaken either by policy-makers or development partners: (a) about the economic structures in certain areas of the country, which can serve as the basis for designing development interventions tailored to their needs; (b) an overview of the current framework for territorial governance in Serbia – not only the de jure, but even more the de facto one – because understanding this is necessary in order to be able to define who is in the best position to undertake which policy measures. We will also make suggestions for smaller, incremental changes that can be made in order to improve the framework for policy interventions. The goal of the project is to contribute to the implementation of policies that are in alignment with EU standards, through motivating citizens to support the process of Eurointegration more intensively and by encouraging decision-makers to implement policies more consistently, and to pay more attention to contributing to meeting the key needs of citizens. Through continuous communication with decision-makers, CSOs, and citizens, through the Convent, consultative meetings and “online” dissemination, the project will quantify, and then illustrate and promote the concrete benefits that citizens can achieve through the genuine implementation of reforms. In particular, this relates to the domain of socio-economic policies, which are generally not harmonized with the EU, but are in the domain of national competencies – and therefore often it is not clear enough how their effect depends on reforms related to Eurointegration. The overall goal is to contribute to the democratic consolidation and institutional reforms in Serbia by contributing to Serbia’s overall alignment with the European Union’s competition policy. It is aimed that progress manifests itself in the advancement of the Chapter 8 negotiation process so that Serbia’s negotiation position is ready a year from the beginning of the project. However, the democratic consolidation and institutional strengthening will be accomplished by the strengthening of the institutions in charge of protecting and promoting competition and of CSOs to call them to account. This, in turn, will be accomplished above all by creating an environment in which broad stakeholders have a greater understanding of how EU Competition policies benefit consumers and how they promote the development of the economy. This understanding, in turn, improves stakeholder engagement and both the support they offer to relevant institutions (above all the Commission for State Aid Control) but also their capability to call them to account. The project is an interdisciplinary and participative bottom up approach to understanding at least some aspects of the key factors underlying Serbia’s greatest development challenges – how competitiveness policies can serve to generate quality jobs and reach those parts of the country (and its population) that are most falling behind. The Specific Objective was to create a framework for knowledge-policy system stakeholder’s interaction among Serbia’s development researchers and practitioners, which will facilitate their engagement in a public debate / participatory process advancing the understanding and policies that can accelerate the accomplishment of economic, social and human development along more than one SDG dimension. 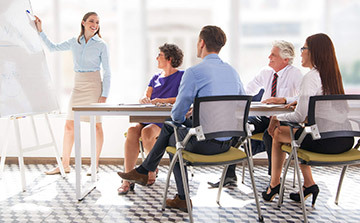 One of the key project’s phases refers to organization of stakeholder dialogue through consultative round tables/workshops to identify key issues in defining key competitiveness – human development linkages, needs for further research to identify drivers of positive change and how they can be measured. For this dialog, CEVES prepared a study “Real Sector Performance and Competitiveness Some Stylized Facts and Open Questions (Serbia 2009-2016)”. The present document is a baseline review of Serbia’s human development and environmental challenges as well as the assets and limitations it faces in advancing towards attainment of the sustainable development goals (SDGs). It provides background information for the design of a society-wide dialogue to help shape Serbia’s nationalization of the SDGs in line with its commitment to the UN 2030 Agenda. The document focuses on those SDG dimensions that CEVES consider key for Serbia’s human development and it does not address existing policy goals or options, nor their implementation. The goal of the Preparatory project was to develop a larger project proposal that would propose a strategy for the development of a broad society-wide dialogue on the SDGs motivated and steered through an independent civil society platform. Such a dialogue put in the context of the nationalization of SDGs that the government and UN plan to conduct could make a critical contribution to ensuring this nationalization exercise is truly participatory, and deals with the issues that are truly at the heart of Serbia’s development challenges. It related to the need to reinforce Serbia’s capacity to steer policies towards accomplishing not only economic growth, but economic development that is more equitable and leaves no one behind, that is both socially just and environmentally sustainable, and that is participatory – making the citizen and local communities the central development agents. Project had a dissemination phase with the aim to further raise awareness on the results of CEVES research and where Serbia stands in the regards with SDGs today. CEVES organized one-day Conference on Serbia’s SDG Issues, focusing on the SDG values, and the challenges of ensuring that economic growth is both accelerated and more broadly spread, considering the growth challenges we are emphasizing above. In the Report we present an additional factor, one that we expect will play an even more important role now that economic growth has accelerated in Europe and Serbia’s fiscal adjustment has been completed. It is in the economy’s atypical structure: a sophisticated economy and skills and resources exist, but they are limited in size, and have a spotty distribution – akin to a leopard’s skin – both across industries and geographically. This structure is the result of a slow and uneven transformation of the traditional economy – built during socialist times – throughout the country’s protracted transition, which produced an uneven deterioration and loss of the skills and resources held in it. Studija predstavlja i izdvaja činjenice o porastu izvoza nakon krize u Srbiji – kao ključni aspekt održivog rasta i konkurentnosti, u kontekstu šireg rasta BDP-a, fokusirajući se na nekoliko sektora koji najviše obećavaju u pogledu dalje konkurentnosti i ekonomskog rasta. Posle kratkog istorijskog pregleda rasta privrede Srbiji, analiza se fokusira se na period od 2009. godine i izvoz koji se registruje od tada. Analiza je sprovedena sa nivoa sektora, ali i sa aspekta večine i vlasništva preduzeća – uslužnih i prerađivačkih, koja posluju u odabranim sektorima delatnosti. The objective of the assignment was to provide order-of-magnitude assessments of the possible long-term impact of the adoption of circular economy practices in three sectors, on national macroeconomic indicators such as GDP, employment, net exports etc. The impact assessment was to serve as an input into the Circular Economy Strategy for the Republic of Serbia. The impact assessment was focused on the economic and social effects of implementing circular economy in the following sectors: Agriculture/Food industry, electrical and electronic equipment and plastic packaging. The assessment included estimation of revenues, costs, value added, profits and jobs generated in case of introducing circular economy in selected sectors. For the purposes of this project, CEVES developed the methodology for assessment of the economic impact of the circular economy using partial equilibrium sector-level modeling, relying principally on the re-calibration of other countries’ experiences to Serbia. Quantifying the changes in key macroeconomic indicators implied the difference in Target scenario (and reaching national targets) and Business as Usual scenario. The analysis included data collection (Serbian and EU official sources), semi-structured interviews with the key informants, growth estimation of economic activities and prices, benchmark analysis, etc. Objective of the assignment was to assess the satisfaction of the companies with the methods and processes in the implementation of cooperative model of vocational education, as one of the steps toward dual education. Modernization of vocational education is one of the key labor market’s requirements. Recognizing the businesses’ need for young professionals, ready to step into the real-life world of labor from day one, the Ministry of Education, Science and Technological Development, in collaboration with the German Organization for International Cooperation (GIZ), through the “Vocational Secondary Education Reform in Serbia” project, as of 2014/2015 school year, started the implementation of a vocational secondary education cooperative model in three three-year-long educational profiles: locksmith-welder, electrician and industrial mechanic. Project activities referred to the online survey as well as semi-structured interviews with companies’ owners, management and mentors that were working together with students. Companies covered referred to those that were included into the cooperative model of vocational education. The main objective was to conduct a baseline assessment of fruit and vegetables (F&V) value chains in Serbia which would be used to determine the impacts of the overall USAID’s Competitiveness Systems Strengthening (CSS) project in the future. This analysis is mainly focused on the processing and downstream (retail chain) segments of the value chain because it is through these segments that CSS is most likely to, with its limited resources, affect the entire competitiveness system. The assessment of fruit and vegetables value chain in Serbia was conducted through Import and Export analysis, Retail Chains Analysis, and Processors/Producers Analysis within the F&V value chain. The first phase of the project uncovered which F&V products were the most significant in Serbia’s exports and imports, focused on exporting companies and differentiation by the type of their exporting products and the type of their buyers. In the second phase, CEVES conducted 200 phone interviews based on USAID standardized questionnaire. The questionnaire aimed to discover the patterns of firms’ behavior in topics of market linkages, networks and finance. The objective of the assignment was to improve the Ministry of Economy’s targeting of employment generation, competitiveness enhancement and investment attraction policies in Serbia by improving the information base and tools on which such interventions rely. The assessment provided detailed analyses of selected industries, benchmarked their competitiveness against competitor countries and provided concrete policy recommendations for the sustained increase in their competitiveness. Performance and competitiveness were assessed based on a detailed database of Serbian Business Registers Agency and Customs data as well export competitiveness of Serbian product on every international market where they were being sold (detailed 4-digit UNComtrade database). Additionally, CEVES conducted more than 130 face-to-face interviews (mostly outside of Belgrade), value chain mapping and quantification, and gap analysis (based on the current and optimal state of each selected sector). The research is the foundation for the Ministry of Economy’s formulation of a new industrial development strategy. The four selected priority industries included two technology-intensive sectors (mechanical and electrical equipment, and rubber and plastic products) and two resource-based sectors (food and beverages, and wood end furniture industry), deemed of highest potential to contribute to Serbia’s competitiveness. In addition, the performance and the competitiveness of 8 sectors were subject to a quick review. Study aimed to map institutional and legal barriers that youth face when starting their businesses in Serbia. Much like their peers worldwide, youth in Serbia are faced with numerous challenges when entering the labor market. Figures from the Serbian labor market show a dire situation for young people, since the unemployment rate of this segment of population is almost twice that of the general unemployment rate. Starting a business is one solution for those inclined towards entrepreneurship – and the percentage of such individuals among youth is 36%, higher than in the general population. However, the share of those who actually start a business is significantly lower. Education as obvious barrier for youth activism and developing skills was not subject of this study. Study gives overview of three particular barriers Serbian youth face: 1) Access to finance and capital; 2) Fiscal and para-fiscal system; 3) Information and practical skills. Beside these barriers which are characteristic for all those starting the business, study shows barriers affecting specific youth groups: 1) Highly skilled youth; 2) Youth in vocational education and training (VET); 3) Youth not in employment, education or training (NEET); 4) Young women; 5) Socially vulnerable youth. This research aimed to establish an independent monitoring of the quality of the work of the health care system of Serbia, which is, however, part of an even broader CEVES’s program aimed at strengthening the monitoring of the quality of work and the organization of public authorities. The project created direct link towards the Sustainable Development Goals, specifically Goal 3 – Ensure healthy lives and promote well-being for all at all ages. Main project output is baseline report that prioritizes a set of indicators and compares the observed data in Serbia with the situation in the selected countries, so that a sufficiently reliable assessment can be obtained, yet sufficiently easy to communicate to the public about the state of health of the citizens of Serbia. The research implied the preparation of preliminary baskets of indicators (quality of outcomes, results, processes and efficiency – system of protection in Serbia) as well as assessment of the weight of each of them. The Development Potentials Index (DPI) is an annual publication which analyzes 114 sectors within the Serbian manufacturing industry and ranks them according to their development potential. The objective of presenting the annual DPI reflects the need to get to know the economy that surrounds us, especially its real sector. We often hear from the media about the achieved economic growth based on general trends of GDP, but without understanding who makes up this growth, who created it and who has the power to build it in the future. Thus, the DPI aims to better portray the state of the economy, respecting all of its entities and potentials, with the objective to recognize the sectors we should build the future growth on. At the very beginning, it is necessary to point out one of the basic principles: Economic growth should be built on the sectors that have the development potential. These are primarily the sectors that are made up of competitive companies, i.e. the companies that are capable of recognizing opportunities to create competitive products, to add value, to be competitive on both domestic and foreign markets, to have positive spillover effects on the rest of the economy, etc. One of the main conclusions is that it is companies which should be brought into focus, as dynamic growth of the economy should be based on the very companies that have the greatest development potential. In order to properly identify leaders, the DPI starts from the bird’s eye view, but soon moves to deeper levels, looking at individual companies operating in the Serbian economy. In particular, it looks at bona fide companies, i.e. the ones that regularly submit financial reports and whose financial reports are meaningful. In total, there were 80,000 such companies in the latest report, which we allocated to 114 different sectors. Sectors were analyzed based on all the firms operating in them, particularly on the results these firms recorded on domestic and on 110 foreign markets, within the period of six years after the crisis (as of 2014). Among the leaders, i.e. the sectors which showed the greatest agility, particularly outstanding were the sectors where Serbia has a strong domestic resource base – agribusiness and wood processing industry (especially the segments of these sectors that add greater value, such as wooden furniture, processed fruits and vegetables, and the like). Besides them, sectors of mechanical industry, metal industry, transport industry, rubber and plastic industry, as well as certain segments of textile industry, stood out as well. In order to fully utilize the potential of all of these sectors, we cannot leave them to develop on its own. Moreover, support measures should not be universal. Namely, some of the prosperous sectors are the very basic ones, such as fruits and vegetables, while the other ones are much more complex, such as production of medical instruments or food processing machinery. All of these sectors are very heterogeneous, so it is necessary to take into account their specific needs and problems they are facing. Therefore, the needed policies should be tailor-made, taking into account the specificities of each sector and drawing out the most of the potential. The project aimed to establish an independent monitoring of the quality of the work of the health care system of Serbia, which is, however, part of an even broader CEVES’s program aimed at strengthening the monitoring of the quality of work and the organization of public authorities. The project created direct link towards the Sustainable Development Goals, specifically Goal 3 – Ensure healthy lives and promote well-being for all at all ages. The project aimed to map institutional and legal barriers that youth face when starting their businesses in Serbia. Much like their peers worldwide, youth in Serbia are faced with numerous challenges when entering the labor market. Figures from the Serbian labor market show a dire situation for young people, since the unemployment rate of this segment of population is almost twice that of the general unemployment rate. Starting a business is one solution for those inclined towards entrepreneurship – and the percentage of such individuals among youth is 36%, higher than in the general population. However, the share of those who actually start a business is significantly lower. Education as obvious barrier for youth activism and developing skills was not subject of this study. The current study presents the performance of manufacturing in Serbia since the crisis of 2009, focused on competitiveness analysis of four manufacturing sectors selected by the Ministry of Economy: food and drinks (F&D), wood and furniture (W&F), rubber and plastics (R&P) and machines and equipment (M&E). The study is conducted within a broader project (“Competitiveness and Jobs”) implemented by the Government of Serbia and World Bank, whose aim is to mitigate and remove barriers for boosting competitiveness and employment. The purpose of the study is to contribute to the improvement of business and investment environment – especially in selected sectors – in a way that implementation of activities proposed in the study leads to the promotion of development, competitiveness and employment, i.e. elimination or mitigation of the main identified barriers. Also, the purpose of the study is to inform the development of an industrial development strategy in line with the EU negotiating chapter 20 – Entrepreneurship and Industrial Policy, which is about accelerating the structural adjustment, encouraging the creation of business-friendly environment, fostering domestic and foreign investment, promoting small and medium enterprises (SMEs), as well as supporting entrepreneurship and innovation. 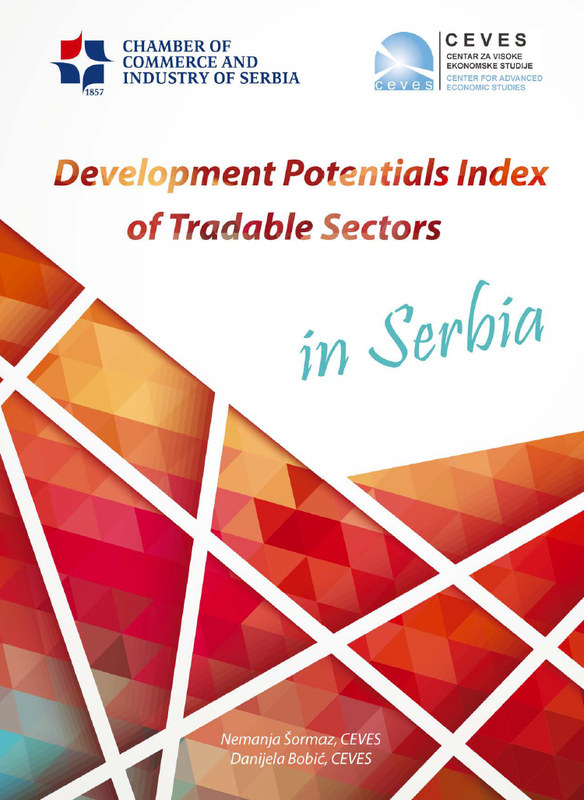 The objective of the assignment was to assess performance and competitive potentials of tradable sectors in Serbia’s economy, through an innovative tool developed by CEVES – Development Potentials Index (DPI). The specific goal was to create an innovative and comprehensive tool that would provide better insight into tradable sector competitive patterns in Serbia. DPI results made a foundation for the selection of four priority sectors by Ministry of Economy. DPI represents a composite index that uncovered detailed performance and competitiveness patterns of all tradable sectors in Serbia. This analysis was primarily based on quantitative analysis: 114 tradable sectors were assessed with 120 indicators of different weights; 6 years observed period after the strike of the global crisis in 2009; 80.000 companies detailed performance analysis, international competitiveness product analysis on 110 foreign markets, etc. DPI was consisted of nine pillars: (1) general performance, (2) export performance, (3) sustainable performance, (4) growth potential, (5) potential for spill-over effects, (6) sophistication potential, (7) employment creation, (8) investment attraction, and (9) encouragement of entrepreneurship and development of micro and small enterprises. The analysis covered as well: 1) economic impact of global commodity (oil, gas, coal, iron, steel, copper, aluminum, lumber, agribusiness) on key performance indicators of affected sectors in Serbia’s economy; 2) in addition to rankings of individual sectors, rankings of the most important value chains were also produced, in order to assess the performance and functionality of a sector surrounding and its ability to develop in those conditions. The Quarterly Monitor of Economic Trends and Policies in Serbia (QM), initially developed by CEVES in 2005 by Kori Udovički, (current President of the Governing Board and Chief Economist of CEVES) has now become the most representative and relevant publication of the Foundation for the Advancement of Economics (FREN). QM regularly monitors and analyzes the general macroeconomic situation and economic policies in Serbia, comparing it with the EU and other countries in South-East Europe. QM’s main aim is giving a thorough insight on the state of Serbia’s economy, together with offering comments and recommendations to policy makers on the most serious issues Serbia is facing. Quarterly Monitors focus on six main topics: Economic Activity, Employment and Wages, Balance of Payments and Foreign Trade, Prices and the Exchange Rate, Fiscal Flows and Policy and Monetary Flows and Policy. The QM current Editor-in-Chief is Milojko Arsić, economics lecturer the Faculty of Economics at the University of Belgrade and former Member of the Council National Bank of Serbia. Objective of the assignment was to identify the critical success factors and most binding constraints along value chain of fabricated metal products sector and to create a detailed SWOT matrix which should serve as a baseline for creation of a sectorial action plan. Main activities: The analysis provided a deeper look into the performance and export competitiveness of this industry; discussed the possibilities for further performance and competitiveness enhancement; identified the main levers and opportunities for development and internationalization of this sector and uncovered the characteristics of these opportunities in greater detail; and finally identified concrete factors of company’s competitiveness, which should be addressed with adequate support and policy design. Originally CEVES’ flagship product and today FREN’s, has set new standards in the local economic discipline by offering consistent and thoroughly assessed data on all major macroeconomic aggregates, and providing a thorough analysis of the processes related to economic growth, and monetary, external and financial developments. The main goal of this case study is to provide a sound knowledge about the performance and competitiveness of a selected industry, and to determine the reasons explaining that performance and competitiveness, by focusing on the identification and understanding of critical success factors (particularly industry-specific). The identification and understanding of hidden potentials and factors is the first step in the process of the creation of required industry-specific knowledge, which can provide essential information to key stakeholders and policymakers in order for industry to prosper. The study identifying the critical success factors and most binding constraints along value chain of fabricated metal products sector and to create a detailed SWOT matrix which should serve as a baseline for creation of a sectorial action plan. The Project “Supporting and Stimulating Growth of Competitive Industries” is funded by Serbian Chamber of Commerce (SCC) and it started in late April 2015. The aim of this project is to provide recommendations, necessary for creating targeted sectorial support, that will remove, or at least minimize the most binding constraints and untie untapped potential for growth of competitive industries. These recommendations should help Serbian government and Serbian Chamber of Commerce to quickly establish an improved information base for better targeting of industrial policies essential for revitalization of Serbian economic life, employment generation, and growth. The existing regular monitoring and projections of Serbian sector performances, needs and challenges are analytically weak and, more importantly, based on unreliable and incomplete economic statistics. However, this kind of information is essential for participants on Serbian market to act in a proper way. The Project “Serbia’s Real Sector Performance: Exhibited Competitiveness by Size, Industry and Region” is funded by USAID’s Sustainable Local Development Project (SLDP) and represents a valuable Research Asset for Improving SME and Competitiveness Policy in Serbia, developed under the SLDP Project. The Project duration was from March 2014 until January 2015. This Project aimed to improve the targeting of employment generation, competitiveness enhancement and local development interventions in Serbia by improving the information base tools on which such interventions rely. It described the performance and growth potential of the most relevant business sectors in Serbia over the period from 2005 and 2013, pointing to the likely key factors that determine their success. The Project “SME Growth Opportunities and How Policies and Banks miss them” is funded by USAID Business Enabling Project. The Project duration was from July 2013 until October 2014. The purpose of this project is to motivate banks and other stakeholders to search for procedures and financing modalities more suitable to the SME market segment, than are current bank practices, by presenting strong evidence of missed opportunities with current practice. The purpose of the grant is to raise bank awareness that current bank credit practices miss opportunities for generating bank profit and enhancing SME growth, which will be achieved by conducting work on SME market segment and outreach activities with banks. Therefore, we organized two roundtables at National Bank of Serbia. The first on 19th of June 2014 and the second one on 7th of October 2014. The objective of the assignment was to assess the performance and shed light on the most promising industries, with the potential to drive sustainable growth and development of Serbia’s economy through enhanced international competitiveness and exporting activities. In addition, this research also shed light on industries that have obvious market potential but struggle to achieve their goals and realize this potential full potential. The research represents CEVES foundational research of Serbia’s real sector economy, and most importantly, it is the one of a kind in Serbia. By this study, CEVES set the foundation and contributed to the evidence-based policy making in Serbia. The particular result was shedding light on good performing SME-based sectors, which were at the time significantly underrated. This research brought series of innovation in sectors analysis in Serbia: introducing the performance analysis of average/median company in the sector (not only overall sectors performance), bridging different international classifications that enabled joint analyses of general firms’ performance and international performance etc. CEVES invested time in cleaning SBRA database and identifying bona fide companies (separating those that conduct “real” businesses, and earn from it, from those uncreditworthy and/or with irregular reporting) and conducted assessment only on those. The assessment included preparing of series of different financial and international performance indicators; which were statistically analyzed by multivariate Principal Component Analysis (PCA). Project aimed to emphasize the poor quality of statistical data in Serbia, especially on sectorial level, in terms of their practical application in the analysis of performance and consequentially decision-making itself and make recommendations to overcome them. The project systematically analysed key economic series, comparing and contrasting related variables and relying mostly on economic logic to show key gaps and problems. The focus was to compare GDP by production and expenditure structure with source information, deflators and price series, as well as delve as deeply as possible into formal and informal knowledge about the assessment methodologies applied to explain the inconsistencies. Ultimately, the project identified some key fundamental assumptions that are regularly being made and that probably do not adequately reflect Serbia’s reality. The key audience included policymakers in the Ministry of finance, the Fiscal Council, and the IFIs. Objective of the assignment was to motivate banks and other stakeholders to search for producers and financing modalities more suitable to the SME market segment than the current bank practices, by presenting strong evidence of missed opportunities with current practice. The aim of the project was to assess whether and in which way commercial banks in Serbia can increase their lending towards resilient and growing SMEs. This analysis covered two components. The first component focused at shedding the light on the structure, performance and growth potential of Serbia’s SMEs. The second component aimed to understand and analyze bank SME funding practices in order to identify if there are opportunities to expand funding to the mutual benefit of both banks and SMEs. Our analysis and assessment were based on indicators from financial statements of all enterprises that have operated in Serbia in period of 2005 to 2012. In addition, CEVES interviewed heads of sales and risk departments in 11 banks (approximately 70% of the banking market in Serbia). Objective of the assignment was to conduct the survey of the company in order to identify the key factors underlying the performance of enterprises in Serbia. 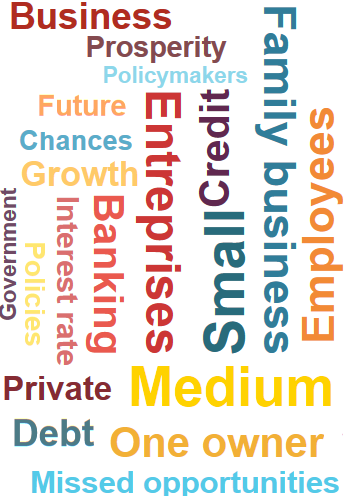 The research covered ten general topic areas of private sector operations in attempt to broadly identify and assess what was the motive for firms’ establishment, what firms do, how they are structured and run, what is their corporate governance, whom they interact with and how they form their expectations are for the future. The survey covered 1,062 face-to-face structured interviews, prepared by CEVES and executed by IPSOS Strategic Marketing. Entrepreneurship in Serbia – necessity or opportunity? This study aimes to emphasize the poor quality of statistical data in Serbia, especially on sectorial level, in terms of their practical application in the analysis of performance and consequentially decision-making itself and make recommendations to overcome them. The project systematically analyzed key economic series, comparing and contrasting related variables and relying mostly on economic logic to show key gaps and problems. The focus was to compare GDP by production and expenditure structure with source information, deflators and price series, as well as delve as deeply as possible into formal and informal knowledge about the assessment methodologies applied to explain the inconsistencies. Ultimately, the project identified some key fundamental assumptions that are regularly being made and that probably do not adequately reflect Serbia’s reality. The key audience included policymakers in the Ministry of finance, the Fiscal Council, and the IFIs. The purpose of this study is to assess the access to finance of Serbian SMEs. It is also a foundation for further research aimed at developing policy recommendations that could help enhance the SME sector’s performance, growth and their contribution to the overall value added. Expansion and development of the SME sector is both the opportunity and necessity for Serbian economy. This report has two components, first that is focused on demand side and second, that is focused on supply side. The first component aims at shedding the light on the structure, performance and growth potential of Serbia’s SMEs, a very large segment of Serbia’s economy that is little understood, and has been relatively neglected by both policymakers and the public. The purpose of the second component is to understand and analyze bank SME funding practices in order to identify if there are opportunities to expand funding to the mutual benefit of both banks and SMEs while at the same time contributing to the country’s growth. This report assesses the performance and sheds light on the most promising industries, with the potential to drive sustainable growth and development of Serbia’s economy through enhanced international competitiveness and exporting activities. In addition, this research also shed light on industries that have obvious market potential but struggle to achieve their goals and realize this potential full potential. Project aim was to perform a brief analysis of performance and potentials of two globally fastest growing industries in Serbia – business process outsourcing and information communication technology. Analysis uncovered numerous advantages of Serbia as attractive destination for outsourcing and investment in IT sector, but it also analyses current situation in Serbia’s IT sector – performance, key players, opportunities and barriers for Serbian IT Companies. Main activities included: analysis of Serbia country profile, labor market analysis, IT sector analysis and presentation of relevant researching results. Project aimed to produce recommendations for the new SME strategy, support alignment of Serbian policy and practice with the key Copenhagen criterion on the existence of a functioning market economy and help to unleash Serbia’s growth potential and boost firm performance. The project consisted of several steps, where the first one was to conduct interviews with economic experts; non-economic experts; decision makers; regional development agencies; private sector/entrepreneurs; CSOs; media. In the next phases CEVES conducted SME performance analyses and successfully disseminated results in public. The aim of this analysis is to evaluate direct and indirect costs caused by certain administrative procedures. Also, in the study there is calculation of the costs of the entire economy that arise as a result of the execution of certain administrative ones obligation. CEVES was engaged by The World Bank to analyze and rank municipalities in Serbia according to their level of development and consequently help allocate central government’s development funds to stimulate equal regional development. This report deals with the problem of attracting investments in the Jablanica and Pcinja districts. The aim of the study is to establish the reasons why the inflow of investment in Jablanica and Pcinja region is unsatisfactory, as well as to propose measures to improve this situation. Jablanica and Pcinja are two most economically undeveloped districts in Serbia, with living standard below the republican average. As a key problem that prevents acceleration economic growth, increasing employment and improving the living standards of citizens, low capitalization of the region was identified, insufficient number of economic entities and insufficient inflow of investments. . The report is the result of a fundamental research work, which included a detailed analysis of relevant literature, statistical analysis data, conducting surveys in the region, interviews with relevant actors in the region (including representatives of local economy and representatives of local authorities), talks with relevant representatives of the republican government, talks with associations representing them large domestic and foreign investors, and the analysis of the survey in which local companies and members of local government took place. This research aim to understand and describe the new service sector in Serbia. In global economy, financial capital is being increasingly directed toward countries abundant in knowledge and skills. Knowledge is fueling economic growth and development in every region of the world. Rapid advances in Information and Communication Technology (ICT) provide the means for developing countries to accelerate their progress or even leapfrog stages of development, which would enable their integration into the global economy.The “new” service sector, particularly knowledge based services, may well have been booming in Serbia over the past few years. FREN’s and CEVES’ research is aimes to fill a great gap in understanding the new services sector in Serbia. Detailed and rigorous survey of the services sector in Belgrade – bound to account for the lion’s share of the new service sector in Serbia – assesses the structure, dimensions, key development factors and development potential of the service sector in Serbia. To seize the opportunity and transform Serbia into a knowledge economy, carefully designed policies are needed, aimed at enhancing human capital and developing appropriate infrastructure. This research provides policy makers and businesses with consistent information required in order to build on Serbia’s strengths and remove obstacles. The objective of the assignment was to perform the pre-evaluation tasks of USAID’s Community Revitalization through Democratic Action (CRDA) program and Serbia Enterprise Development Project (SEDP). CRDA and SEDP were among the most important projects implemented by USAID in Serbia, aimed to strengthen Serbia’s democratic processes and economic transition. In the course of these programs, more than $200 million has been spent on achieving desired goals. The project assessed socio-economic impact of these two programs. The focus of assessment was the estimation of the following: employment created as a result of CRDA activities; additional income generated; additional agricultural sales; full-time equivalent jobs created. The assessment included both direct and indirect impacts of the programs. Additionally, in order to adequately assess economic activities within programs, and to determine which project types had a larger relative impact, a cost-benefit analysis was performed. The assessment had to provide solutions for a series of issues, including the frequent changes in program objectives and priorities; and the multidimensionality of CRDA program that added complexity to the definition of priorities. This research aim to understand and describe the new service sector in Serbia. In global economy, financial capital is being increasingly directed toward countries abundant in knowledge and skills. Knowledge is fueling economic growth and development in every region of the world. Rapid advances in Information and Communication Technology (ICT) provide the means for developing countries to accelerate their progress or even leapfrog stages of development, which would enable their integration into the global economy. The “new” service sector, particularly knowledge based services, may well have been booming in Serbia over the past few years. FREN’s and CEVES’ research is aims to fill a great gap in understanding the new services sector in Serbia. Detailed and rigorous survey of the services sector in Belgrade – bound to account for the lion’s share of the new service sector in Serbia – assesses the structure, dimensions, key development factors and development potential of the service sector in Serbia. To seize the opportunity and transform Serbia into a knowledge economy, carefully designed policies are needed, aimed at enhancing human capital and developing appropriate infrastructure. This research provides policy makers and businesses with consistent information required in order to build on Serbia’s strengths and remove obstacles. The aim of this report is to analyze the economic part of two USAID projects, Community Revitalization through the Democratic Action (CRDA) and Serbia Economic Development Project (SEDP) USAID projects, and prepare them for formal evaluation. Special emphasis will be placed on analysis of the characteristics and adequacy of the chosen indicators, the contents and designs of databases used for monitoring purposes (Web-PRS and SEDP tracking database), their suitability for the evaluation purposes and on preliminary conclusions about the impact of SEDP and CRDA economic programs. Health care sector in Serbia was one of the sectors that were affected by the waste set of reforms commonly branded as a transition process. One of the biggest problems at the beginning of health reform was a deficit of reliable data that would build the baseline and enable evidence-based policy making and monitoring within the health sector. Policy-makers have realized that if they wanted to develop policies to enhance the performance of their systems, they needed reliable information on the quality of financial resources used for health, their sources and the way they were used. In this paper indicators obtained from NHA data provide evidence on spending patterns for all sectors – public and private, different health care activities, providers, and country regions. Information have been used to make assessment if changes in expenditures reflect the main strategic orientations on the reform of the health system and compare results with those of other countries. This report explores regional characteristics of the labor market in Serbia carried out in the second half of 2004, as part of the preparation of the National Strategy employment for the period 2005-2010. The basic idea was to Identify regions in which labor force members are exposed above the average risk of unemployment and recommend to economic creators policies and local actors to contribute to the reduction regional differences in the Serbia labor market. The study on labor market map of Serbia strives to comprehensively examine the situation on the labour markets in districts and municipalities and to discover what impacts very different in performance regional labor markets. This research also looks at the prospects of the labor market in the regional dimension and offers recommendations for employment-oriented policy. In 2006, CEVES submitted a study for the Deputy Prime Minister’s “Poverty Reduction Strategy Implementation Focal Point”, investigating the defining criteria for municipality underdevelopment. The main aim of the analysis is elaborating a methodology, uncovering the current and prospective economic and welfare conditions of municipalities. Despite the lack of data, CEVES could identify several indicators which enable to measure municipal underdevelopment and to rank the municipalities accordingly. Furthermore, CEVES study provided recommendations for future data collection practices, in order to have more reliable and substantial data to work on. CEVES report published in 2007 consists of a deep and comprehensive analysis of macroeconomic figures, including key price, exchange rate, production and output data, publicly available fiscal, monetary and external sector data. The main focus of the report was on the national accounts data and on providing a new framework for the analysis of Serbian economy. The study uncovered substantial mistakes and problems, especially related to the GDP level and the expenditure structure. The final conclusions of the study called for a prompt revision by the Republic Bureau of Statistics (SBS) of the official methodology and figures for GDP and investment. This report explores regional characteristics of the labor market in Serbia carried out in the second half of 2004, as part of the preparation of the National Strategy employment for the period 2005-2010. The basic idea was to Identify regions in which labor force members are exposed above the average risk of unemployment and recommend to economic creators policies and local actors to contribute to the reduction regional differences in the Serbia labor market. The study on labor market map of Serbia strives to comprehensively examine the situation on the labor markets in districts and municipalities and to discover what impacts very different in performance regional labor markets. This research also looks at the prospects of the labor market in the regional dimension and offers recommendations for employment-oriented policy. The main goal of this analysis is the development of a methodology to measure current conditions as well as prospective welfare of municipalities. The subject of this study is the comparison of (under)development among municipalities of Serbia. The study attempts to measure the main dimensions of (under)development of Serbian municipalities. This report presents a comprehensive assessment of Serbia’s key macroeconomic statistics and aggregates, the essential economic information that can be derived from it with reasonable certainty, and a reassessment of the GDP level and expenditure structure. The assessment covers key price, exchange rate, production and output data, as well as all publicly available fiscal, monetary and external sector data. It documents the data and presents it in analytically useful formats; it documents the collection methodologies and inventories key weaknesses in it; it points to inconsistencies among the series, providing an assessment, where possible, of the likely actual dimensions of the aggregates. An alternative set of figures is offered for the GDP level and expenditure structure in 2003 and 2004. The purpose of Volume II report is to analyze the value added of the enterprise sector of Serbia, as recorded from financial reports submitted to the Solvency Center in 2001-2004, and its behavior with regard to forms of ownership, size and activities, and then assess the impact of ownership structure and its changes on economic growth, productivity, employment and labor costs.